Sweet 16 is a momentous stage in life of many stages such as life in high school, steps toward adulthood, dreams of life, crushes on that special one. Sweet sixteen usually meand a birthday celebration with family and friends, which mean our special sweet 16 party supplies to create a special birthday celebration. 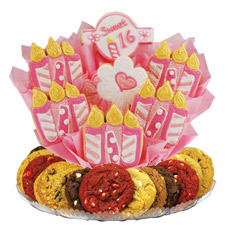 Sweet and sixteen, it's her special day and this pretty in pink cookie bouquet is the perfect gift for her and her friends to share. This item is priced as a 7 cookie.